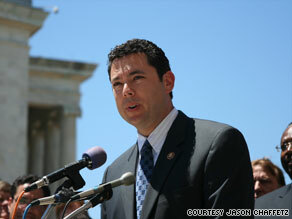 Jason Chaffetz says more people in Washington need to learn how to say no to added government spending. (CNN) -- If you ask each of the 435 members of the House of Representatives whether they believe in cutting government waste, I'm willing to bet they'll all say yes. Saying yes is easy in the United States Congress. It's saying no that we seem to have a problem with. Despite widespread support for the idea of cutting waste, there seems to be little interest from the majority party in actually making it happen. To do so would require the use of a word no one in this town wants to say. That two-letter word can brand your party forever as the dreaded Party of NO. Instead of tightening our belts in a tough economy, Democrats in Congress are voting repeatedly for dramatic increases in federal spending across the board. Last week, 46 Republican members of Congress announced the formation of the Sunset Caucus. Rep. Kevin Brady, R-Texas, and I will chair this caucus, which is intended to identify and eliminate wasteful or duplicative programs. It's our goal to use the amendment process to add provisions to upcoming appropriations bills that will eliminate specific programs. I know the risks of saying no in this town. You don't get rewarded for saying no to bad policy ideas. You get labeled as an obstructionist. Just ask Oklahoma GOP Sen. Tom Coburn, aka Dr. No. But I believe the voters sent me here to do just that. Fortunately, I'm not alone. I'm joined by my colleagues at the Republican Study Committee -- a group whose numbers I hope will continue to swell. I'm joined by my constituents, who made this their top issue. And I'm joined by Americans across this country who attended tea parties and numerous other protests to demand better accountability from the federal government. They know we cannot keep running this country on a credit card. The challenge is daunting. Congress is very good at implementing new programs and new spending. They haven't been so good at monitoring the effectiveness of all those programs and cutting the ones that no longer justify taxpayer funding. It's all too easy to sell the idea that we need to spend more government money on more government programs. It's fun to be the party of yes -- yes to every new idea, every new tax, every new opportunity to pay tomorrow for what we use today. Everyone likes you when you say yes. Democrats are banking on the idea that these are the days of "yes, we can" spending. But times are changing. Americans are demanding that Congress learn a new word. They're sending people like me to Washington, people who aren't afraid to say the word no and mean it. Our government cannot be all things to all people. We can no longer afford to fund outdated and expensive programs that serve no discernible purpose. Why are we still subsidizing mohair to the tune of $28 million a year? This subsidy was implemented by a Korean War Congress hoping to reduce the cost of military uniforms. But long after we stopped using mohair in uniforms, we continue to subsidize the industry. Who is watching what we spend? Certainly not majority Democrats in Congress. They're too busy appropriating large budget increases for federal agencies -- 12 percent in the last appropriation bill. With the help of Americans fed up with irresponsible spending, I hope to see wasteful and duplicative programs ride off into the sunset -- never to be seen again. American taxpayers are over-taxed, over-extended and over-committed. We don't have a revenue problem in this country -- we have a spending problem. It's time we made a serious effort to rein in spending, limit the size and scope of the federal government, and ultimately restore financial solvency to the greatest country in the world.